I was expecting awful. Really awful. But the thing is I don't get why this got panned at the cinema. Was it because it wasn't particularly reverential of the source material? Maybe, although it's not like you bump into hundreds of Green Hornet fans every day, but who knows, maybe they lurk at newspapers and magazines waiting for 'their' hero to hit the big screen. Thing is they could have played this completely straight: the Hornet's origin story would have worked as a dark twin to the Dark Knight, but thankfully Rogen, who co wrote the script with Evan Goldberg, sees the funny side of this spoilt rich kid come good and plays it for laughs. Sure it's not all comedy gold but enough of it works to not make it a failure. Kato, played by Jay Chou, is the mastermind behind The Hornet's gadgets, not to mention the reason he survives most fights. Rogen plays the fool well, with Chou as his frustrated sidekick, and there's a truly hilarious fight between the two. A grown man shouldn't laugh at another man getting kicked in the nut sack, but none the less, a grown man did. 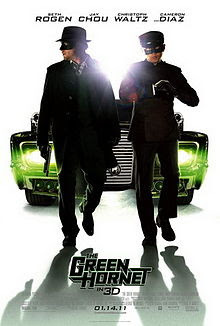 Cameron Diaz is the 'love interest' and she glitters as you'd expect, gets a few decent one liners but ultimately it's Rogen's show and despite what you might have heard Green Hornet works because of that. The story is not really of consequence, it zips along at a decent enough pace and although patently ridiculous the laughs keep you entertained, even as a sawn in half car carries on driving... out of a lift... firing missiles from its hood. It isn't reverential to the comic, but because of that, in a movie gene pool full of earnestness, it feels like a breath of fresh air. Rent it. For laughs and that.